On Christmas Eve, 1943, the newly formed but undermanned Homicide division of the Melbourne police force is called to investigate the vicious double murder of a father and son. When Military Intelligence becomes involved, Homicide's Inspector Titus Lambert must unravel the personal from the political. 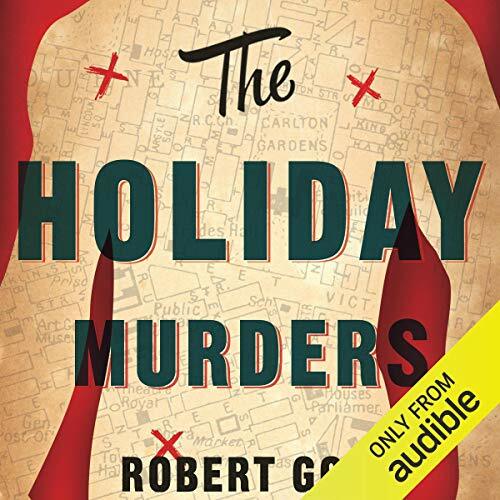 The Holiday Murders explores a little-known and sometimes violent corner of Australian history, and finds oddly modern echoes in its paranoia, xenophobia, and ugly fervour. I saw this as a "dead tree edition" in my local library and decided to look it up on Audible. It was there and I took it. I wasnt disappointed. Its a good solid policing mystery... I think I read somewhere that it has a basis in fact from around the latter part of WW2 in Melbourne, Australia. Its "mildly grizzly" in places and I think is winds-up a little too quickly (a bit like my school essays once I had reached the 2000 word mark!) but a good yarn all the same. One observation... if you asked me to describe how I envisaged the leading police characters, they would all come out like the actors in "Miss Fishers Murder Mysteries" !! !